We recently had a chance to practise our rudderless sailing, and here are a few more pointers we've picked up on. Here at Caution Water, usually we've done something before we write an article. In the case of rudderless sailing, Becky had to do it as part of her instructors course, which is getting on for two years ago now. I had never done it, other than playing around with heeling a boat and the sail settings, but that was with the rudder still firmly attached just not in use. Last weekend we had the opportunity to practise rudderless sailing, and have a few additions to make to the article. We were doing this in a GP14, but it should work in any two-person boat. You can do it in a 1 person boat such as a Laser, but the lack of a jib sail makes it harder to do. We made it sound so simple before when in fact it's not. The starting point is to get the boat sailing in a straight line. The centreboard needs to be raised so it's down only about a third of the way. The mainsail should be set initially for halfway between a beat and a reach, and the jib pulled in similarly. The reason for this is you then have the ability to pull the sail in or let it out depending on which way you need to go. This is where the problems start - as we mentioned before, it's easy to overcorrect if you're going off course, and if you overcorrect repeatedly, you will go in circles. - To luff up, or head up to windward (point higher to the wind), pull the MAIN SAIL IN or put your weight on the LEEWARD SIDE. - To bear away, or head away from the wind towards downwind, let the mainsail out, pull the JIB SAIL IN, or put your weight on the WINDWARD SIDE. What we found out is if you wanted to for example luff up and head more upwind, and you pulled the mainsail in AND put your weight on the leeward side, it massively overcompensated and sent us heading upwind, and through a tack. If we just wanted to steer up wind, we could do it by only pulling the mainsail in, and keeping our weight balanced centrally. 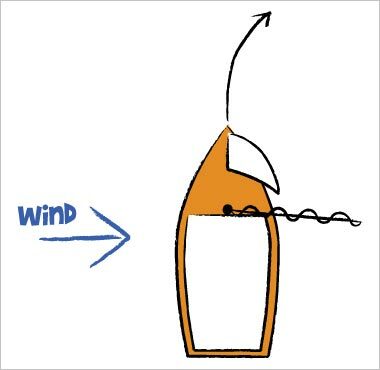 If we wanted to STOP going further upwind, then pulling the jib sail in overcompensated - the best way was to balance the weight onto the windward side and leave the sail settings alone. This balance change was enough to stop the boat still steering into the wind even more. Similarly but in reverse, sailing away from the wind showed similar results; to move towards sailing downwind, the main was let out slightly and the jib pulled in, but to stop the direction change and straighten out again, the sail settings were reset to a straight course (both about 1/3 out), and we used balance on the leeward side to straighten out the course. If you need to tack in a hurry, then put your weight on the leeward side and pull the mainsail in - similarly, if you need to gybe in a hurry, put your weight on the windward side, and pull the jib in, however remember you will have to react very quickly, probably half way through the tack or the gybe to change the sail and balance settings. Because the boat reacts slower to these changes than to directional changes with a rudder, you need to make the change earlier for it to take effect - about half way through the tack or gybe, depending on how fast you are going at the time. What it all comes down to is fine control of balance settings - to do rudderless sailing well you need a very good grasp of balance and also you need to be able to spot directional changes very quickly and respond to them quickly but gently. Finally - it's not advisable to try rudderless sailing in less than about 5 knots of wind (Force 2), as when you only have the gentlest of breezes or thermal wind patterns, the wind is too shifty to be able to read or sail rudderless with, as you'll find yourself constantly headed or lifted and constantly playing the sails and balance, and you may find it hard to read what you should be doing - it was like this when we first tried, and for a while the sail and balance settings actually responded in completely the opposite direction to above. Just read your articles on rudderless sailing and would like to add a few points. Firstly though I would recommend everyone to try it out. In my experience the best thing to do with the rudder when practising is to tie the tiller central with some bungee cord, then it'll act as a skeg so will hold you in a straight line more. There are good and bad points to this. 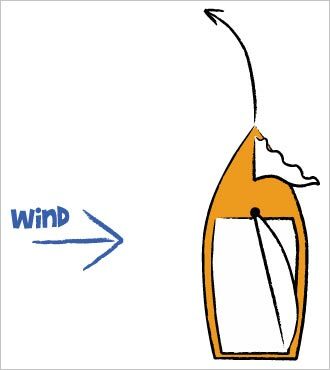 It makes the turning affect slower which is good for practise as it eliminates over steer, but you'll probably find it tricky in lighter winds - the boat won't turn, or very slowly. I think once you got the hang of balancing the boat and sailing without using the rudder, then you can lift it out for the next step up. N.B you can also grab the rudder and steer away when it all goes wrong. The main reason people should learn how to rudderless sail is it applications in racing. Everytime you use the rudder to turn, it acts like a brake and slows you down, if you can turn the boat without using the rudder your not going to lose any speed. It also makes your turns, tacks and gybes a lot smoother and easier, especially in a single hander. If you've ever been trying to gybe in a strong wind but the boat just doesn't want to, a bit of heel to windward (over on top of yourself) and sheeting out a little will help immensely. It all comes from rudderless sailing. Also if you can get you boat sailing in a straight line just using your balance and sail, your not going to be fighting the turning moment with the rudder which slows you down. It may seem like a small thing, but it all adds up, and you'd be surprised how much extra speed it gives you especially in the lighter winds. Also just to point out that going upwind, your never going to get as close to the wind rudderless as you normally would, so don't try. The best your probably going to manage is a close reach. Keeping the speed is more important than how high your pointing. A single hander rudderless is much more susceptible to balance than a double hander, try and use the sail as much as possible, one step at a time. You might find it easier to start lying to, then bearing away to a run as well.